With Sonar 2.2 and above you now have two options on setting up professional audio cards. ASIO and the method sonar prefers which is called Kernal Streaming (KS) support. KS is only found with cards that have WDM drivers. This guide was written as the waveprofiler can give some wrong values and setting up card like the dsp24 cport cards incorrectly when 24 bit is selected. 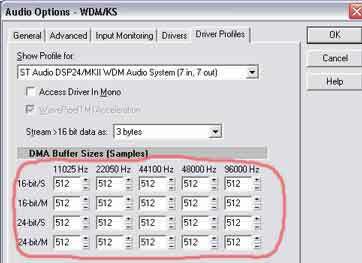 When 24 bit is selected if your not getting any sound or white noise then read and follow the instructions outlined below. As setting up the card with ASIO drivers is very simple I will concentrate only setting up Sonar using KS drivers and low latency. This guide is not designed to be 100% complete as your Sonar manual explains everything else you'll need in adition to this article. For more help contact the support for Sonar or your audiocard. First open up the hardware settings for your card and ensure that you know the buffer size that your card is using. The card pictured is a cport and its using a buffer of "512". Remember what your card is set to as we will need this number later on. Open up sonar and go to the OPTIONS menu and then AUDIO. Browse to the "Driver Profile" tab, which is pictured to the left and enter the buffer size that your card is set to into all of these boxes. After doing this step its important NOT to run the waveprofiler or all of these values may be changed to the wrong value. The other important change is to set the "stream >16 bit data as" 3 BYTES. Once you have done these two steps your most likely going to be working and can record and play back 24 bit in SONAR. For lower latency in Sonar, go to the GENERAL tab and set the "buffers in playback queue" to 2 and move the slider marked "buffer size" all the way to the FAST setting. If you want lower latency then try changing the buffer size of the audio card (see step 1 above) and follow this guide all the way through again. You should then have a click and pop free setup with very low latency in 24 bit. Please see the St Audio KNOWLEDGE BASE for any more indepth information on how to setup Sonar.